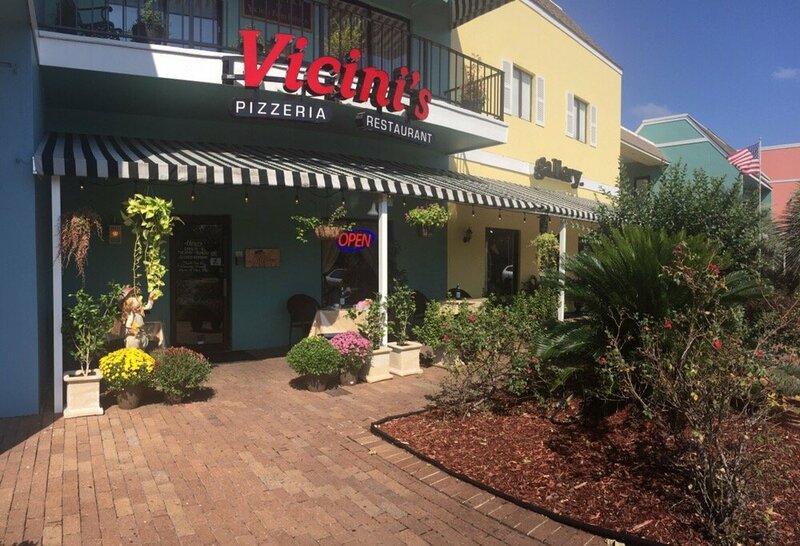 In December 2015, Vicini's opened in Myrtle Beach at 5001 N. Kings Highway, under the supervision of owner/chef Sokol Molla. Molla and his wife Vitoria are originally from Albania, but he grew up in Italy, where he worked in the culinary field in Tuscany for many years. After moving to New York in 1999, Molla and Vitoria continued to work in pizza restaurants for more than fifteen years before opening Vicini's in Myrtle Beach. This restaurant is the perfect example of the American Dream, and the food there is impeccable. Molla emphasizes cooking food that is made from scratch and consisting of only the most quality ingredients. Vicini's offers lunch and dinner menus, with offerings including a variety of specialty pizzas like Margherita, Bianca, and Primavera, with customizable pies available as well. Beyond pizza, Vicini's provides Stromboli, calzones, and a seemingly endless repertoire of pastas, including various types of spaghetti, ravioli, manicotti, and much more! The restaurant also serves lighter fare like salads and sandwiches. For an authentic Italian taste that you won't find anywhere else, visit Vicini's in Myrtle Beach! Like Vicini's, Little Italy at 3001 North Kings Highway brings back the flavors and foods of the Italian Old World. Devoted patrons say that Little Italy brings New York style pizza to the Grand Strand, and its Florentine dishes are very popular among visitors. For more than a decade, this restaurant has been serving hand-made pizzas, ranging from Napoletanna Cheese Pizzas to Sicilian to Brooklyn Specials. And with more than 15 customizable topping choices, the possibilities are endless when it comes to pizza at Little Italy. They also serve a wide variety of pastas, including the palatable Lobster Ravioli and Veal Parmesan with Spaghetti. If you're looking for a traditional New York style pizzeria, Little Italy is just the place for you! Ultimate California Pizza offers up a little bit more of an Americanized pizza and wings culinary culture. With five locations along the Grand Strand, Ultimate California Pizza is convenient and offers up a bevvy of delectable food options. You'll find these restaurants in the Market Common, Barefoot Landing in North Myrtle Beach, Surfside Beach, Murrells Inlet, and in the heart of Myrtle Beach. If you have a large group including kids, you may even want to seek out the location at 959 Lake Arrowhead Road, where, in addition to delicious pizza and wings, you can take advantage of a variety of arcade-style games and activities. UCP's menu includes items like salads, sandwiches, and wings, but the real draw is the specialty pizza. Some of these specialties include the Big Kahuna (Monster Everything Pie), San Francisco (Tenderloin Filet), and Pasadena (Bacon Mushroom Swiss Burger). Ultimate California Pizza goes above and beyond with its seemingly endless choices of pizza toppings, so technically, you would never have to eat the same pizza twice. For a creative and fun pizza experience, make sure you give Ultimate California Pizza a try!